In the beginning of Leviticus, God tells Moses to speak to all the Israelite people and instruct each person in the laws of ritual sacrifice. Lev. 1:5 specifically uses the gender neutral nepes (person) when discussing those responsible for slaughtering the sacrificial animals. “Traditional translations … obscure the fact that both women and men are given instructions about offerings to YHWH.” (Meyers, p.203). Let’s explore how Elisheba, Aaron’s wife and the sister-in-law of Moses, participated in the rites of ancient Israel. 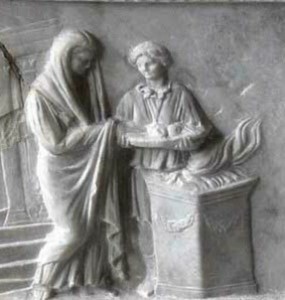 Like any other mother in Israel, Elisheba would have been required to come to the sanctuary to present burnt and sin offerings (Lev. 12:6) after giving birth. This practice continued until the first century. According to the early rabbis who had some experience with the Temple in Jerusalem before its destruction in 70 CE, women could also slaughter the Passover lamb on behalf of their households (Tosefta Pesahim 7:4, 29). The Mishna preserves the story of a race between a man’s sons and daughters to reach Jerusalem to offer the Passover lamb. The daughters won and the lamb was assigned to the family’s name. Thus they acted as legitimate partners in this religious act. Chana Safrai in her dissertation Women in the Temple, demonstrates that women not only participated in the Passover sacrifice, but also the offering of first fruits, the pilgrimages, monetary donations to the Temple and other private sacrifices. Proverbs 9:2 reveals that women could also perform the actual slaughtering of the animals they brought to the Temple for sacrifice. “Later Rabbinic exegesis of both the Bible and Mishnah affirmed the right and duty of women as well as men to engage in the ritual slaughter of animals for both sacrifice and for secular purposes.” (Gruber, The Status of Women in Ancient Judaism, p.155). Together with her daughters, Elisheba would have eaten the meat of the sacrifices along with her priestly husband and sons (Lev. 22:12, 13). Elisheba experienced both the heights and the depths of motherhood. Her other two sons, Nadab and Abihu, offered “strange fire before the Lord, which he commanded them not and they died before the Lord” (Lev. 10:1,2). Regardless of the animals Elisheba may have brought for ritual slaughter, her greatest sacrifice may have been accepting the will of Yahweh who ordered the death of her sons. Safrai, Chana – Women and Temple: The Status and Role of Women in the Second Temple of Jerusalem. Dissertation. KTUA, Amsterdam: 1991.